Click on thumbs for information. See also MFA Works for SALE of older works. ORIGINAL Oil painting on 3/4" canvas, $2,395.00 plus shipping. Click small image to link to purchase page. 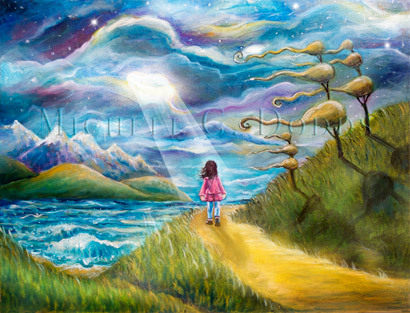 IN MY HEART is in the Lily series of paintings I did about a little girl who enjoys spending time thinking about God’s amazing creation and promises. 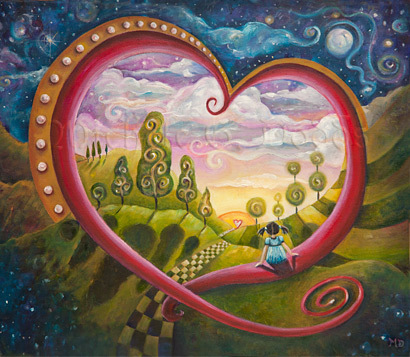 Lily sits in a huge heart looking into the distance at the beautiful sky of spiral puff clouds. A checkerboard path drapes over the hills where trees cast long shadows from the resting sun. It is a reminder God loves us and wants us to spend eternity together. ORIGINAL 28" x 22" painting, 3/4" canvas for Sale, $895.00 plus shipping. THE FLUME is a fast flowing aquaduct with italian trees lining the water channel. Colorful sky with clouds on a farmland also pattern the abstract landscape. ORIGINAL Oil painting on 1 1/2" painted gallery wrap, $995.00 plus shipping. NEAR DAWN Lily looks off into the distance as the sun rises in her whimsical topiary garden. TULIP, Oil, 2010, 20" x 60"
ORIGINAL Oil painting on 1 1/2" painted gallery wrap, $1,495.00 plus shipping. TULIP is larger than life. Red and pink tulip flower makes a room beautiful. 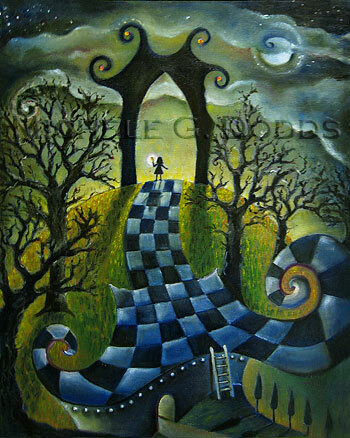 ORIGINAL Oil painting on 3/4" canvas, $2,795.00 plus shipping. 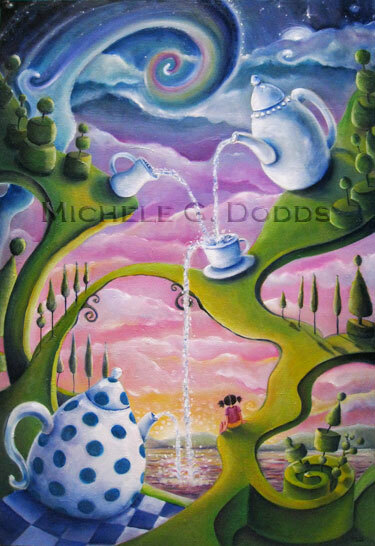 OVERFLOWING TEA PARTY has Lily sits looking at the sunset amongst a whimsical display of garden bridges, waterfall teapots and neatly trimmed topiaries. Feelings of peace and joy overflowing when reflecting on God as in Psalm 23, my cup overflows! 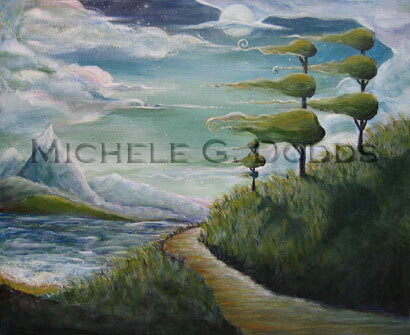 ORIGINAL Oil painting on 1 1/2" painted gallery wrap, $3,295.00 plus shipping. 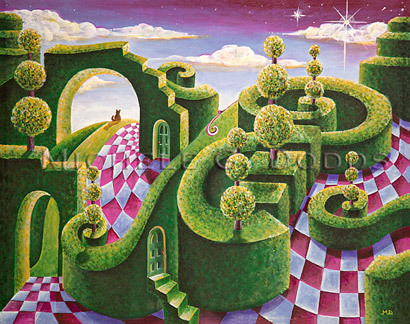 LILY'S GARDEN is place where lily dreams and reflects about God in solitude and silence amongst a whimsical garden of neatly trimmed shrubs and topiaries. 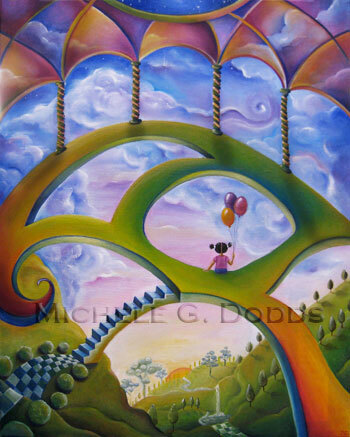 CANOPY SKYWALK oil painting has Lily up on a walkway in the sky. She has balloons as if waiting for a party to start as she looks into the distance. ORIGINAL Oil painting on 3/4" canvas, $595.00 plus shipping. 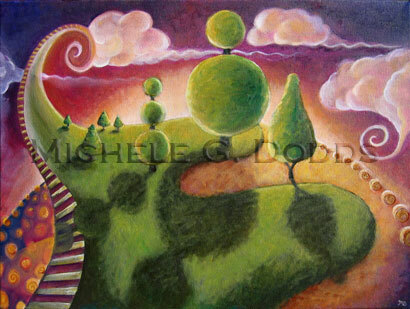 WHIRLY WORLD is an early painting of a whimsical landscape with puffy clouds, trimmed bushes on a small rotating world. ORIGINAL Oil painting on 3/4" canvas, $1,295.00 plus shipping. 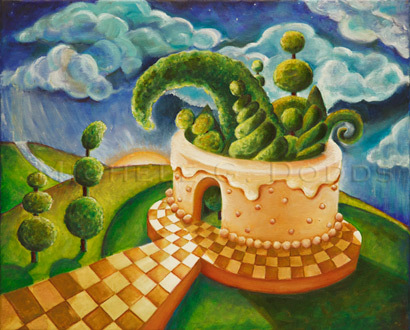 TOPIARY PARTY is about topiaries having a great time inside a cake and others want to join, but are in wait a-la-mode. Large topiary leans over to see who is next in line. 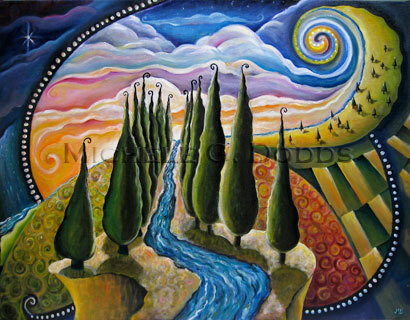 ORIGINAL Oil painting on 3/4" canvas, $2,195.00 plus shipping. 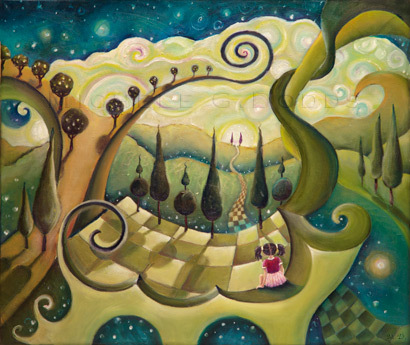 BETWEEN HERE AND THERE has Lily sitting in an surreal whimsical world looking towards a checkboard pathway that meanders into the distance. 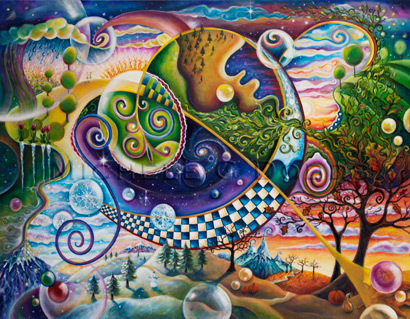 The image is set halfway between space and earth as if in a dream. A feeling of being in a place of limbo between here and there. ORIGINAL Oil painting on 1/4" canvas board, $795.00 plus shipping. 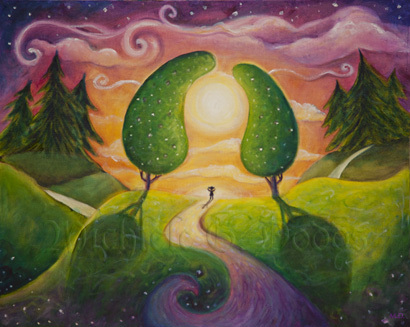 CLARITY is a glowing landscape with a pathway that leads through two pear shaped trees that appear to be hugging the sun. A little one is just at the top of the pathway about to round the corner. ORIGINAL Oil painting on 3/4" canvas, $495.00 plus shipping. A WINDY WAY near the ocean. Tree bushes blow in the wind on a cloudy day near the ocean. 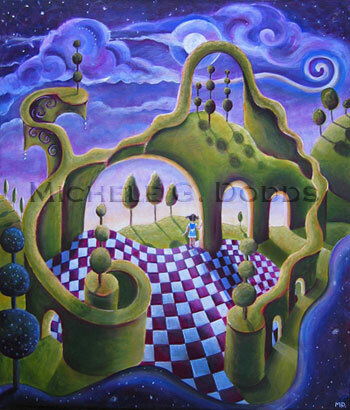 There is a small PORTAL at the end of a pathway in this colorful whimsical landscape. ORIGINAL Oil painting on 3/4" canvas, $1,995.00 plus shipping. One of the first paintings. 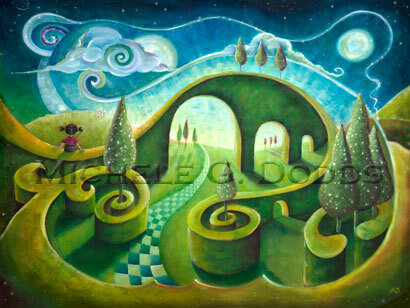 A whimsical garden of spiraling bushes, topiaries and arches. A cat sits at the top edge of a rolling hill overlooking a view. Colors are magentas and greens. FLYING FISH PIG, Oil, 2007, 16" x 20"
ORIGINAL Oil painting on 3/4" canvas, $295.00 plus shipping. 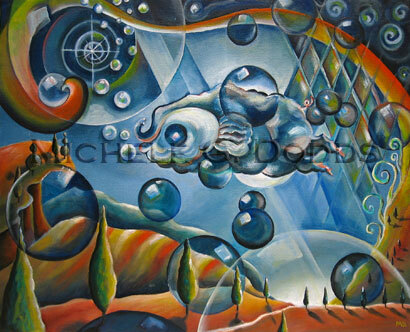 FISH PIG is and abstract dream-like landscape in orange and blues. It has a floating fish pig creature in a sky with bubbles and diamond shapes. ORIGINAL Oil painting on 3/4" canvas, $695.00 plus shipping. Girl walks along a WINDY WAY near the ocean. Sun beams through clouds as she walk along the path on a windy day. 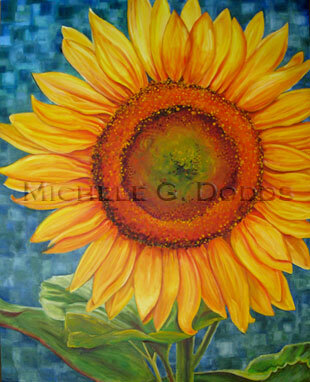 28" x 22" Canvas 3/4" for sale, $1,575.00 plus shipping. 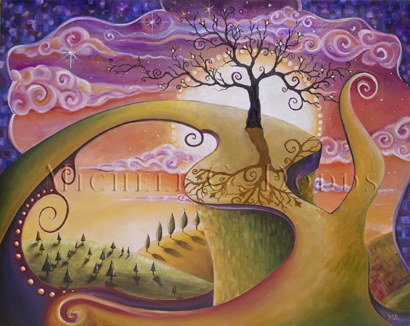 TREE OF LIGHT stands on scenic edge of a cliff that overlooks a golden magenta sky. 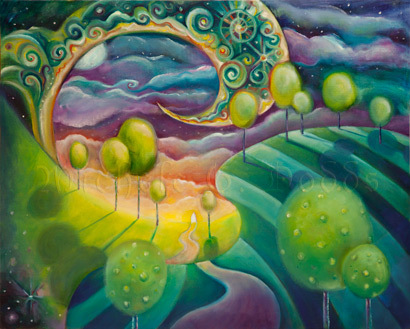 The abstract landscape has swirling clouds, trees and the silhoute of a tree against a large white moon in sky. God determined the times and seasons and the exact places were we should live, so that we would seek him and find him, for God is not far from each of us. Inspired by verse from Acts 17. 26-27. Original Oil Painting, $1,495.00 plus shipping. BY CANDLE LIGHT a little one leaves the safety of her home to venture into the unknown. The light from her faith in Christ guides her to go into the world to face whatever circumstances happen on life's journey. She knows she is never alone, that the Lord is always with her. Original Oil Painting, $5,995.00 plus shipping. SUNFLOWER is a cheerful print that will add beautiful yellow and orange colors to a room, painted on an abstract background of fuzy aqua cube shapes.